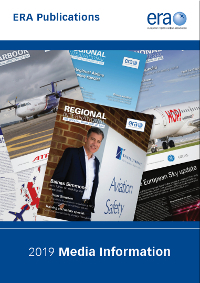 As the only magazine that reaches the entire membership of ERA, including airlines, airports, manufacturers and suppliers, your advertising campaign will be seen by important senior executives and decision makers from Europe’s aviation industry. Copies are distributed to all ERA members and digital editions are available online at www.eraa.org allowing readers to access across all media channels. The magazine is also extensively promoted via email and on all social media platforms. To make the most of your advertising campaign, we will work through the various options available to give you maximum exposure. To make the most of your advertising campaign, we can provide a variety of options that will give you maximum exposure in this key industry publication. Taking one of our six or 12 month packages can also save you money. This is the ultimate publicity campaign for your business. If you take this great opportunity, you will receive the front and back covers, a double page spread of editorial and a spread marker band. It is the package to make you stand out from the crowd and your competitors.